As with our mission programs in other parts of the world, the objective of Understand The Times in South Africa is to come along side and assist other ministries or missionaries that are already established in order to assist them in the call God has upon their lives. As we are not able to be in South Africa and on the ground year around it is important we have reliable representatives that we can trust and help distribute the resources we are able to provide for needs and specific causes. 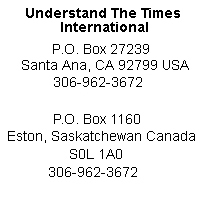 Dave and Krista Meisner will be our Understand The Times representatives for South Africa. 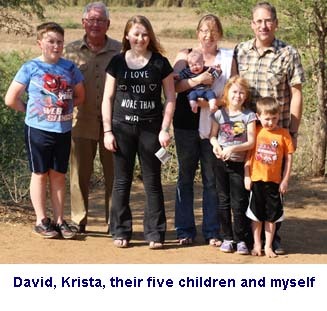 The Understand The Times vision for South Africa is to work with Dave and Krista Meisner to help them distribute resources to a number of needy families by establishing a Bryce Homes program in South Africa. While many organizations around the world strive towards making living conditions better for the people they are serving not always do they care about spiritual needs and where the people they serve will spend eternity. Not so with the Meisner’s and Mission Thando. I have heard the testimonies from people who have been changed by the message of the gospel of Jesus Christ they preach. There are many different ways to plant churches. Some use church growth methods where communities are surveyed and people are asked what “brand” of a church they would like. Some churches advertise the various entertainment programs they have for the children. Others promote “seeker-friendly” or the emerging church style services where any and all religions can join together to establish the kingdom of God. The Meisner’s do not follow any of these man made ideas. They simply show the lost what Christianity looks like by spreading the love of Christ. They care for the poor. They feed the hungry. They care about those who are sick as well as the elderly and shut in. They transport those who have no way to visit a Dr. to their appointments. They help the widows and orphans. They teach the Bible and preach the gospel to the young and old. They have established a church in an area where most white people would never set foot. They do all of this with five children in a location that is more than halfway around the world from their friends and family. While I was in Durban I was able to see the ministry in action and meet many people. I was also able to speak at two meetings held at the Center, one for the youth gathering on Friday night and the Sunday Morning church service. For the present, the Center is where their fellowship gathers for meetings. The Center is simply a rented house in the Quarry Heights area surrounded by other houses. While not a church, it is a shelter and a place where people come and hear the gospel. Almost everyone that comes to the meetings has been impacted by the ministry already because they have experienced what true Christianity is all about. I spoke to the youth group on the topic on the truth of the Bible and why being a born-again Christian is so important when it comes to knowing the truth. On Sunday my topic to the entire congregation was “How to Be a Strong Christian”. This will be my last report. 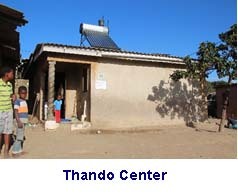 I encourage you to visit the Meisner Mission Thando web site at http://www.missionthando.com/ Also please consider supporting Bryce Homes South Africa though Understand The Times either by check or PayPal. Few people that I know have ever experienced what it is like to be hungry day after day, night after night. Most of us are blessed with an abundance of meat, potatoes, a variety of vegetables and desserts. It is a fact that the majority of us eat more than our share. 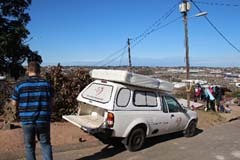 Such is not the case in the area of Quarry Heights, a suburb of Durban, South Africa. The population is made up of primarily poor families who lack food and proper nutrition. Many children go to school with their stomachs empty. They return home after school to find the cupboards bare. Ministering the gospel to families in such an environment without showing concern for the wellbeing of people’s physical needs would be a waste of effort. 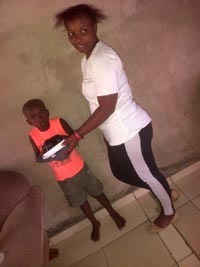 With some funding from a corporate sponsor and funds raised from churches and individuals who donate through their non-profit ministry based in Canada, Quarry Heights children receive food free of charge twice a day five days a week from Mission Thando. 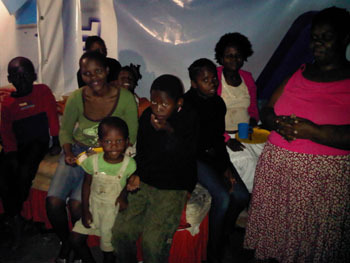 This happens at a house Meisner’s have rented in the area which they also use as a church and youth meeting place. Each morning porridge and sandwiches are handed out to hungry kids before they head off for school. Later in the day David or one of his helpers picks up day-old bread, cakes, pastries, pies and other items from a large commercial bakery and brings it to the Center. I witnessed both the morning and afternoon feeding events myself and saw the impact this program has on the community. The whole community is aware of the work the Meisner’s are doing in Quarry Heights, not only for the humanitarian assistance, but also for the spiritual leadership they provide by teaching the Bible and showing people the love of Christ. The morning and afternoon feedings do not start until the children participate in singing songs of thanksgiving and praying. It is truly something to see. The following photos could not be described in a thousand words. You have to witness something like this in person to appreciate it. The Bryce Homes International Program is a ministry God has raised up in memory of Bryce Oakland who died in a car accident in August of 2001. The program began in 2006 in the country of Myanmar with one home. Now, nine years later there are 60 homes in four countries caring for over 300 children. God has taken ashes and made something beautiful. He has taken the pain of losing a son and brought into existence something too wonderful to describe in words. He has introduced our family to hundreds of children we would have never had the opportunity to know or care for. This is God’s work, not ours. As God provides though His people with financial support we are committed to the expansion of the program by adding more homes. While we have established basic guidelines providing the parameters for the Bryce Homes Program, one of the unique aspects is that we are flexible to new ways God wants to use us to reach out with the gospel to the needy. 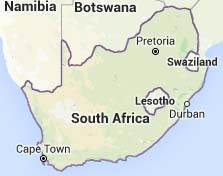 While in Durban the Lord led me to establish four new homes in South Africa bringing our total world-wide now to 64. Describing the background for each home and the reason for choosing the children and the home caretaker would provide the contents for a book. Perhaps in the future I will write a book to try and convey what it is like to meet children, parents and grandparents who live in hopeless situations. I would then show the results when these same people see the love of God expressed to them in a way that shows someone cares. For now, let me say on this visit to Durban we added two more homes in order to assist grandmothers who faithfully attend church in order help support their grandchildren who otherwise would go hungry. While most South African poor families do receive a small pension or stipend from the government, it is not enough for them to survive. The two grandmothers we have added are in their 70’s and not in good health. One has diabetes with a leg amputated and suffers from heart problems. The other has had a stroke and is confined to her bed most of the time. In both cases David Meisner picks these grandmothers up at their homes to bring them to church every Sunday morning. 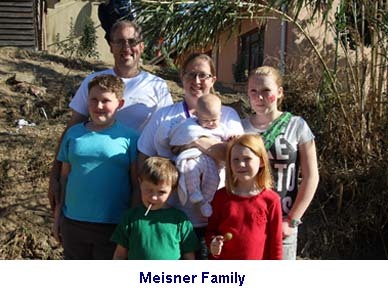 The Meisner’s met them because they were helping them with their medical needs. It was because of this they became believers in Jesus Christ. 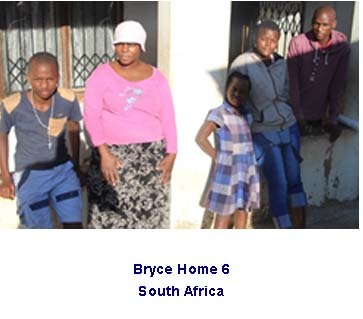 Understand The Times and the Bryce Homes South Africa program will now come alongside to assist with further support in order to make their lives somewhat more bearable. A third grandmother who attends the church is a widow who serves the elderly. On a very small stipend she works for Mission Thando as a care giver to the elderly. Each day she visits 20 older ladies and helps by bathing them and giving them their medication. She also delivers the day old bread the Mission Thando ministry receives as a donation from a Durban commercial bakery. The fourth Bryce Home we have added will provide support for a young girl who is also a new believer and attends Meisner’s church. Krista and Dave became acquainted with her when they helped her with a serious medical need. Through this outreach she came to Christ. Through the Bryce Homes Program she will now be able to finish her High School. Her vision is to continue her education and become an administrative secretary. On Sunday morning I saw her worshipping the Lord with tears streaming down her cheeks. Another life transformed. 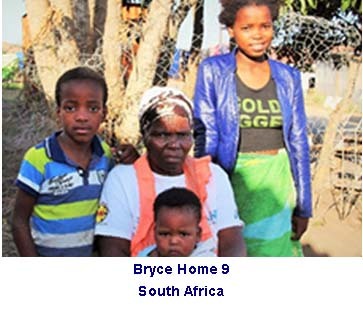 Bryce Homes International has been formed as a program designed to support orphans and/or very poor children in a home environment. Our guidelines require Christian leadership and personal care that assists in providing spiritual guidance, food, clothing, education and medical assistance. Unlike many programs that target humanitarian assistance alone, our emphasis has been to find reliable accountable men and women with integrity to manage our programs in each country and location where we are working. In Durban, South Africa the Meisner family, missionaries from Saskatchewan, Canada are the ones we have chosen to head up the Bryce Homes South Africa Program. Dave and Krista are committed to work among the poor and unfortunate and to help them both materially and spiritually. One of main objectives for taking this trip to South Africa in July of 2015 was to visit our five existing homes and measure the progress since my last trip two years ago. This way I am able to personally assess each individual family and adjust the program accordingly as special needs arise. As well, there have been a few changes and new families or children replace those who have moved on. We like to be open to special needs that we were not aware of before and replace those who have benefited from the program and are now capable of working towards self-sufficiency. It took us about one day to visit all the five homes we are supporting in Quarry Heights. One situation we observed was a health issue. One of the grandmothers who cares for an entire family was suffering from a severe condition of shingles and had been confined to bed. Her mattress was broken down and wire springs were poking into her body as she tried to find comfort. David and I went to a local furniture store where we had purchased some furniture for this family before and bought a new mattress and transported it to her humble home. We prayed for her before we left. On Sunday she was sitting in the front row of the church service to hear me teach. In another one our Bryce Homes we were informed the teenage girl we have been caring for was in the hospital. When we first met her we saw that she had been born with a deformed back. David and Krista had transported her many times back and forth for medical appointments. The Dr.’s made the decision to operate to correct the problem. On Sunday afternoon we made a trip to the hospital where she was located and took her grandmother and visited her. The compassion and love that Dave and Krista have for the people they shepherd is truly commendable. David arrived at my bed and breakfast location with his vehicle loaded with food supplies that would be delivered when we visited our five Bryce Homes. About one year ago David was hijacked by thugs and his vehicle was stolen. Thankfully, David was not harmed. Our first destination was the Mission Thando Center located in the heart of Quarrey Heights. This is an area where the government has relocated over 10,000 people. 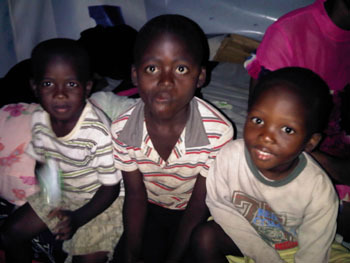 Most of them are still living in severe poverty conditions. David and Krista have been called to this location from Canada to “spread the love of Jesus.” The meaning of the word “thando” in the Zulu language is love. Their Mission Center is simply a low cost rental house they have secured in the area where they can administer their outreach to the Quarry Heights community. The current goals and objectives for Mission Thando are as follows: orphan care, after school programs, computer classes, youth programs, feeding programs (morning and afternoon each day) for the hungry, HIV/AIDS programs and elderly care and assistance. Their non-profit organization raises support for their work (please read the details at http://www.missionthando.com/donations). Presently, a staff of four assist David and Krista to implement this program. This is my third trip to Durban. I have seen tremendous growth and progress since my first trip and highly recommend the work they are doing. If you have ever considered supporting a missionary family in a faraway land, your investment in the Meisner’s ministry would be a good one. As previously mentioned, besides Mission Thando, the Meisner’s oversee and administer our Bryce Homes program in South Africa. In a following report I will share the details of the visits we made to each Bryce Home. I have arrived in Durban, South Africa and will be here visiting David and Krista Meisner and our Bryce Homes for several days. 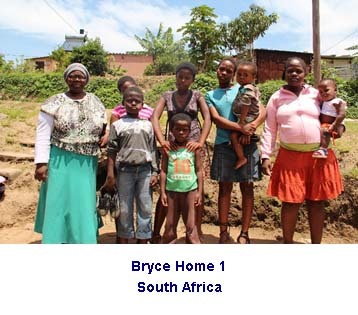 The Bryce Homes South Africa Program was established in Durban, November, 2011 when I made my first trip here. David and Krista are missionaries from Saskatchewan, Canada. They have five children ranging in age from 14 years old to a newborn baby. I have known David since he was a small boy as he went to school in Eston with Bryce. David and Krista administer the South African Bryce Homes Program for Understand The Times. They have founded their own non-profit organization and are very active in reaching out to the poor and unfortunate in the Durban area. 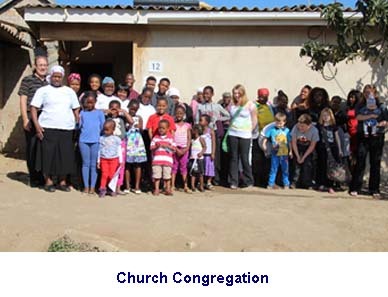 As well they have planted a church in Durban and work extensively with children and young people. Our goal in ministry has always been to work together with established like-minded ministries to advance the gospel of Jesus Christ. The Meisner’s are a perfect example of this. We are very pleased to be able to partner with them. While I am here we will not only be visiting all our Bryce Homes, I will be looking at the possibility of expanding the program. Daily reports will be posted on our website with photos that will keep you updated. 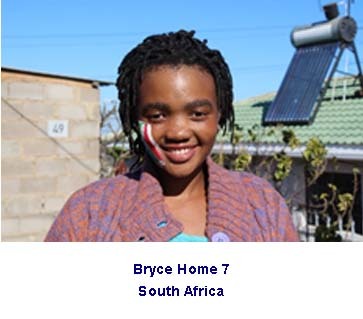 As well I will be shooting video footage so that we can provide more information about Bryce Homes South Africa. I am excited to update you on all the God is doing through your generous support. 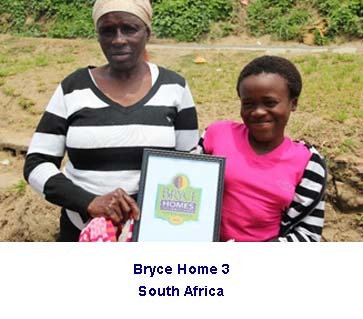 The Bryce homes in Durban South Africa are doing so well. We recently baptized 6 individuals from the homes. Pastors Art and Ruth Bartlett from Pangman, Sask. helped us out!! We have more to baptize as well. The families are doing well. The food and support we give them is making a difference. There are many challenges but the support along with the Bible teaching has been so helpful. We are seeing an increase in their faith. The families have experienced many challenges but we see more and more that they turn to God through their difficulties. One of the other homes had both the Granny and her grand-daughter get baptized. The granny was so brave stepping into the cold pool!!! We also have had great things happening in our home where we are now caring for two more orphans who are flourishing now that they are receiving love and support. 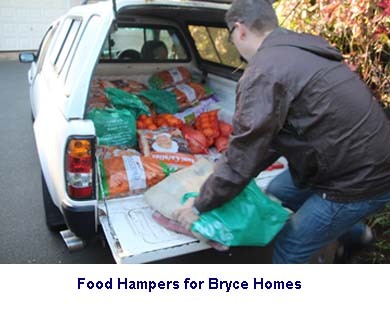 This past year we have been providing food and support for the Bryce homes through your support. This means that these children can go to bed with a full stomach and go to school. We take them fresh vegetables like onions potatoes and carrots as well as rice, and Mealie meal. The children’s uniforms and school fees were paid for through UTT and this has meant so much to these children. I have been monitoring the reports and the children are doing well overall. The families are very thankful!! also provide them with things like toiletries. The church has been growing with both young and old. We recently began a ministry caring for the elderly who do not have enough help. God has truly blessed this ministry and we are seeing women give their lives to Jesus and more and more elderly are reaching out for support and God is touching their lives in a powerful way. We are seeing miraculous healings. One woman not only gave her life to Jesus but went from not being able to get out of bed to now being able to walk without support for a short while. We are also running a feeding program in Ntuzuma where we have been assisting with a daycare. The lady who runs the daycare wanted to help feed the children in the area. We are providing ingredients for soup and she feeds up to 50 children 3 times a week. This has been a blessing to the community. Through her we have been able to help some of the elderly in the area including helping to finish building a house for an elderly woman in the community. There is a lot of need in this community and we hope to be able to assist them further as well!!! Thanks so much for all the support. May God be glorified!! One year has passed since my first trip to Durban, South Africa when I first visited David and Christa Meisner, missionaries from Canada. David was the same age as our son Bryce and he grew up in the same town, Eston, Saskatchewan. Since Understand The Times made a decision to shift our main focus to help poor and needy Christians around the world by coming alongside pastors and assisting them financially, we felt that David and Krista’s ministry would be a perfect fit and a very good investment. It was while I was in Durban a year ago that I decided to revise the Bryce Lodge Myanmar program to become the Bryce Homes Program. It became apparent to me that we could accomplish more and make a bigger difference by establishing Christian homes overseen by local pastors that would help in distributing food, provide better living conditions, education and Christian education. The Meisner’s agreed to partner with Understand The Times to work towards this goal in a very poor area where they minister in Durban. 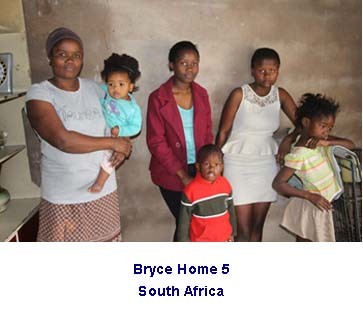 While there last year the needs of one particular family deeply touched me, we made the commitment to begin the Bryce Homes South Africa Program by providing monthly support for food and clothing for this family. As the tin shack this family called home was deplorable, Understand The Times provided the funds to have a new home built for them with a cement floor and brick walls. David organized some volunteer help along amongst his youth group and with a few paid construction workers the project was completed. The new home is like a mansion compared to the shack they were living in. Before, ten adults and children all slept and ate in one room. They will now have a toilet, shower and three rooms for sleeping and eating. Each person, adult and child will have a bed to sleep on. There are a few more things yet to be done such as adding a solar hot water heater and plastering the walls and painting the interior and the exterior. Understand The Times has committed the funds to complete this project. 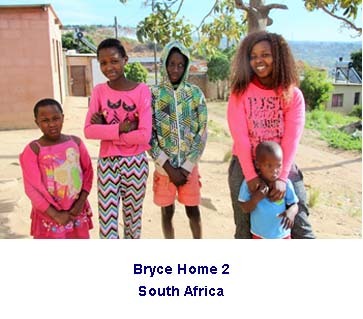 Bryce Homes Two and Three in South Africa are specifically designated to provide education for students who would otherwise not be able to go to school. The Meisner’s provide the care for Bryce Home Two. The student is Desmond. 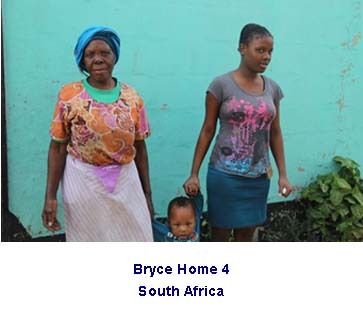 Bryce Home Three is overseen by a widowed grandmother who attends David and Krista’s church. She looks after her granddaughter who is going into grade eight. The grandmother does not have enough money to feed her grandchild nor send her to school. 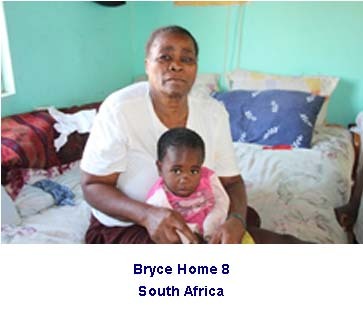 While in Durban we made the commitment to establish two more Bryce Homes by assisting two more families. This will make a total of five Bryce Homes in South Africa. In every case the children attend David and Krista’s church and youth group. My trip to Durban was very rewarding. I was able to see the tremendous difference that had taken place in one year. Please pray for the Meisner’s and the work they are doing among the poor in Durban, South Africa. 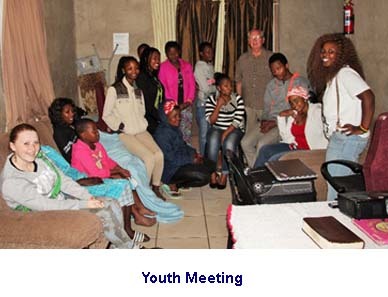 Each Friday evening they hold a youth service in their home attended by over 25 young people..
those who are need. The work that the Meisner’s are doing is truly the Lord’s hand extended. While Understand The Times provides some personal support for the Meisner family, their ministry goes far beyond the Bryce Homes South Africa Program into a number of other areas. They are presently in the process of setting up their own non-profit organization in Canada. I strongly recommend that individuals, other organizations and churches support their work. I am attaching a picture of the Gumede family taken at a recent service. I cannot begin to tell you all that God is doing in their lives but it is amazing. As we have been getting to know them more and more and hearing all that God has brought them through I can only tell you that the support from UTT had been the answer to their many prayers. Dave's dad will give you some video footage as well as some more photos!! The Masuku family is doing very well too and God is really increasing their faith. They have become very involved in the ministry and are very thankful for your support. This too is an answer to years of prayers, even those of their late Grandmother who was a Christian and prayed for them. That is one of the memories of their family that they often share. How are you doing? How is Ron? We have been praying for all of you as a church. 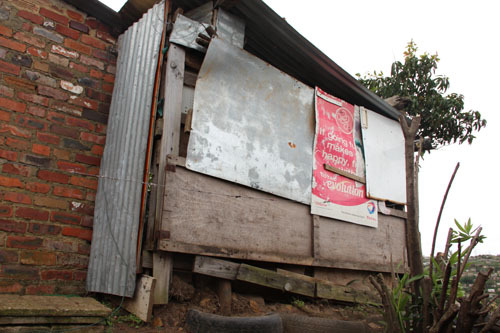 The Gumede family live in a small one room shack at the back of a relative’s home. There are eleven people living in the shack. There is only one bed. Those who do not sleep on the bed will lay on straw mats on the floor. The family has very little for possessions and struggles to have food to eat and clothes to wear, with only a small income coming in. One of the daughters is sick with seizures and has some brain damage as a result. Another daughter was raped and became pregnant. Another of her children passed away leaving grandchildren in her care. Mother Gumede, is a woman of great faith and has become a regular attendee of church along with her family. The food that is provided through Understand the Times has made a huge impact on the family. By providing basics such as flour, sugar, mealie, rice, beans and oil the family is doing much better. They give God praise and say that He has looked upon them and blessed them. The family is happy to attend church on Sunday morning and the older daughters have also joined the Tuesday Bible study. Ma Gumede has testified that since coming to church they have seen God bring good change to their lives. The Masuku family is led by Nombulelo. She recommitted her life to the Lord last year and has been a huge blessing to our church. She is helping with music and children’s ministry. Her younger brother Desmond is also involved and has a strong call on his life to minister the Gospel. He desires to go to Swaziland and preach the Gospel when he is finished school. The family has no parents and have struggled to survive for the past ten years. The assistance from UTT has helped with food as well as school fees and uniforms. Please pray that God will provide a home for the family so they can all be together. This family also lives in Quarry Heights. Their mother passed away leaving the oldest brother to care for his two sisters. The oldest brother, Tsepiso quit school to work and take care of his sisters, Msinhle, grade 11 and Thobile, grade 7. The money he makes is not enough to provide for the basic needs of the family. Thobile goes to school at Quarry Heights. We have been able to help the family with food and school bags for the girls. We hope to get to know the family better in the coming weeks and see God really work in their lives. They live in a shack that leaks terribly and are in need of a proper home. I trust all is well with you and your family, and that you had a wonderful Christmas and new year! 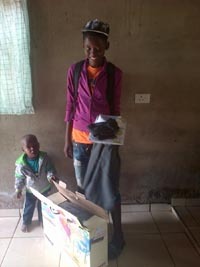 This week we visited the Gumede family to deliver some vegetables, carrots, potatoes, onions and butternut squash. They were once again overjoyed by the gift! While there we inquired about uniforms for the kids to go to school. School begins this week. As I spoke to the ladies, Mama Gumede was sitting on the floor of the small shack. She began weeping and crying and giving praise to Jesus. 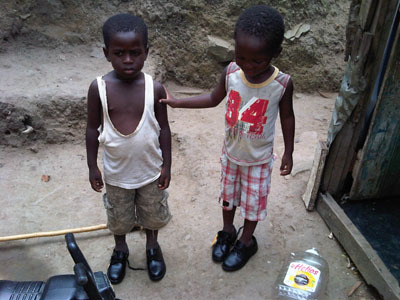 None of the kids had uniforms because they could not afford them. Here in South Africa uniforms are a requirement. Through the donations you have sent we have been able to not only provide food for this family but now have also purchased uniforms and shoes for three of the children. The family is so thankful for the support and this month we will begin to help even more families through the amazing support of UTT. Through the family we have also seen more children coming to church. It is very exciting to be able to minister into the lives of these children!!! Thank-you so much for all the prayers, encouragement and support!!! The Gumede family live in a small one room shack at the back of a relatives home. There are ten people living in the shack. There is only one bed. Those who do not sleep on the bed will lay on straw mats on the floor. The family has very little for possessions and struggles to have food to eat and clothes to wear, with only a small income coming in. One of the daughters is sick with seizures and has some brain damage as a result. Another daughter was raped and became pregnant. Another of her children passed away leaving grandchildren in her care. Mother Gumede, despite their obvious lack has always got a smile on her face and a song to sing. The entire family loves to worship Jesus. Every time we visit they want to sing. This last time she wanted us to read Romans 6:1-13 telling us how much she loved that scripture. The food that is provided through Understand the Times has made a huge impact on the family. By providing basics such as flour, sugar, mealie, rice, beans and oil the family is doing much better. They give God praise and say that He has looked upon them and blessed them. The family is happy to attend church on Sunday morning and the older daughters have also joined the Tuesday Bible study. Thank-you for the difference you are making in their lives. The following report came from Dave and Krista Meisner regarding their visit to the shanty home I visited in Quarrey Heights W in Durban. We left funds behind to do something immediately. We visited the family on Monday night when we were passing out food. It was my first time there (Krista) and I was amazed by this precious family. They were all gathered in their room sitting on their bed eating. Their smiles lit up the room! The hug I received from "Grandma" was one of those great big bear hugs, and she wasn't letting go!!! Through translation she explained how she knew that we had brought the food through your donation but that it was really from God!!!! I was so blessed by her understanding. She then asked her daughter to lead a song about the power of the blood reaching to the highest mountain and the lowest valley!! The whole family sang and there was a powerful presence of God in that little shack. I prayed with the family and invited them all to church on Sunday and they eagerly said they would all be there!!! There is something truly precious and unique about this family. Please pray that God will direct us to other families like this that your support can assist! We know there are many in need but finding Godly caregivers takes God's leading and discernment!!! Thanks again and we will keep you informed on how things are going!!! 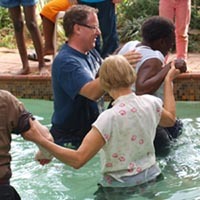 I am here is Durban visiting David and Krista Meisner who have a tremendous ministry reaching out to the poor and needy. David originally is from Eston, Saskatchewan and is about the same age as my son Bryce if he were alive today. Yesterday, I spoke at New Hope Christian Academy, the school where two of the Meisner children attend. The topic was Dinosaurs and the Bible. The children seemed delighted by the presentation. 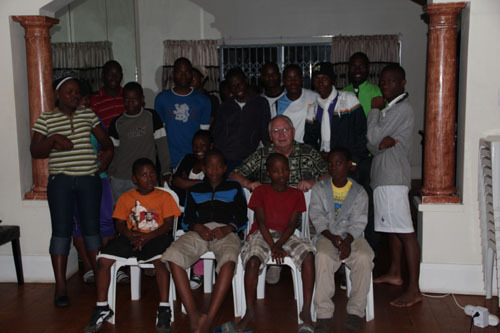 In the evening I spoke to the youth group which is held at the Meisner home. About 20 young people attended and listened to a lecture I gave that emphasized that the Bible view of origins helps us to understand the origin and history of life versus the deception of evolution. I am most encouraged to see how this missionary couple and their family are reaching out here in this part of the world to those who are in need. The fact is there are many in need. Westerners who sit in their comfortable megachurches pleading to have their ears tickled have no idea what it is like in other parts of the world where people live from day to day. We pray that more people will wake up out of their sleep and do something that will count for God like the Meisner’s are doing. It is also encouraging to see that they are not here to play games but are 100% sincere and committed to serve Jesus. The Bible states that there will always be the poor as long as there are people on planet earth. Sometimes we become so consumed with the troubles we encounter in our daily lives we forget about the needs of others. From what I understand about the heart of Jesus, we need to have a reality check about what we are doing as servants of the Lord – are we helping the poor by being His hand extended. Perhaps, this is why I have been sent to Africa at this time. Maybe I needed a shocking reminder. For the past year or so I have been compelled to warn Christians who are building their kingdoms to remind themselves of what they are doing as Jesus will soon be returning. Few have listened. Besides I have lost most of the friends I once had because they are more concerned about their legacies here on planet earth than they are about standing up for the truth. volunteering their time to serve the poor black community that have more needs than you could possibly imagine. from other sons and daughters who had died from AIDS. The shack they lived in was covered by a roof of tin that was leaking. The dirt floor had turned to muddy slime. The naked children were not able to get their footing and slipped and fell in the mire.I asked some questions through the help of an interpreter who spoke the Zulu language. The 56 year old grandmother was a Christian This was the reason I was taken there. As you can understand this poor lady was helpless. David Meisner and I prayed with her. I told her I would do what I could to help out through the Meisner’s. Today I will be at Pastor David’s church. They meet in a school room in this same area where I visited this family. I spent some time early this morning putting some thoughts together which I hope will be encouraging for them. During the night I woke up several times. Thoughts were going through my head and a few questions like this: would it be possible to find ways to come along side and help out at least some of these people with some of the basic needs of life as well equip them for sharing the gospel with others?